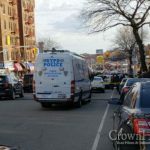 Planned protests following the death of an emotionally disturbed man has the Jewish community in Crown Heights on edge, and police beefing up their presence in an effort to head off any unrest. Video of the man menacing a number of people, with what appears to be a firearm, moments before he was shot was released by police. No less than seven different protests appear to be planned following the death of Saheed Vassell, 34, an emotionally disturbed man who was shot and killed by police officers who were responding to 911 calls of a man menacing people with a gun. 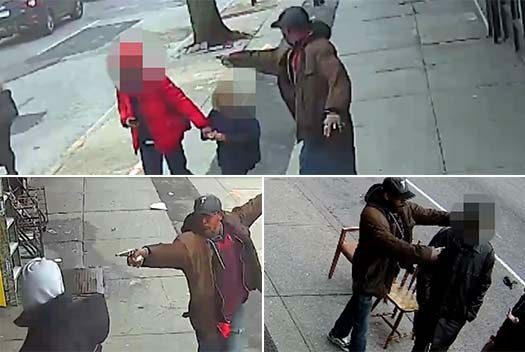 In surveillance video, captured on cameras from stores all along Utica Avenue, Vassell can clearly be seen walking up to people and pointing what appears to be a silver firearm at people, one of them was a woman walking with a child. The videos were released ahead protests that are being advertised as social media, and that have activists within the Jewish community worried. “There are outside agitators that clearly want to take advantage of a tragic situation, and we are seeing ‘dog whistles’ for what clearly mean that unrest or outright violence is planned by these agitators,” said one community activist. Police in turn have brought in reinforcements, with hundreds of additional police officers from all five boroughs streaming into Crown Heights. 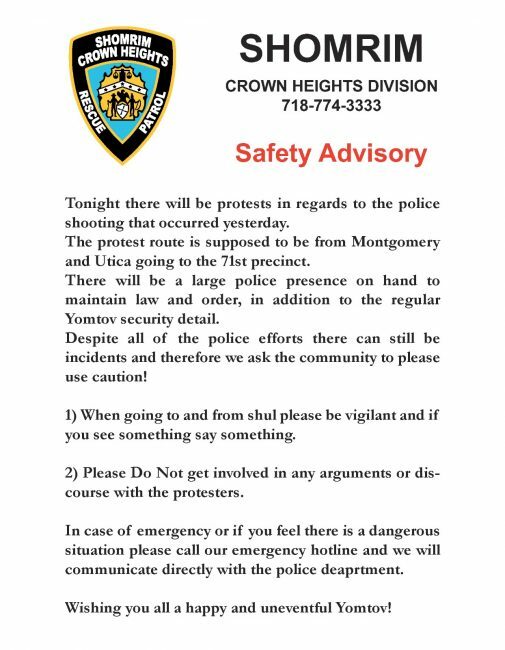 Crown Heights Shomrim issued an informational alert that urges residents to keep alert and be safe. 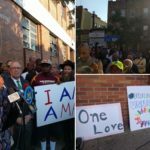 They noted that the protest route is planned to run from Utica Avenue and Montgomery Street all the way to New York Avenue – right through the heart of Crown Heights’ Jewish area. Hopefully everyone will behave and we will all be safe. Hashem Yishmor. Reminds me of 1991. Please guys be safe be vigilant. The Chag Cherusainu will assist us. But we absolutely need to do our part. This is tragic. My condolences go out to the Vassell family. Sad story. Rest in peace Shaheed. If there was a rumor the PD will randomly check protesters for criminal status and unemployment benefits (if protests takes weeks and they don’t actually seek employment but claim benefits) they may not have a minyan. Why don’t the blacks march to get their own people to be responsible for relatives who might be mentally ill ow whom are on medication? Or how about a demonstration by blacks against committing ANY crime? While I understand from the perspective of the police, he pointed what looked like a gun at them. But I want to say the city should do more to help people with mental health challenges before tragedies occur. And why are their relatives free of responsibility? We must not become a Police State. Sure looks like s gun to me. Exp the way he is standing and pointing. Would you take a chance. Police get the blame but their life is on the line everyday. Just looking for a reason to protest. I left as well. This would have ended in my neighborhood sooner. Many civilians are armed and would not be prosecuted for such an act. Let’s pray for the day we don’t need to worry about such things. Moshiach now. you can only envy “their” organization, instantly effective, unlike us. every time we need to protect our rights our leaders” act against us” as a result of countless pylpulim and no good results. and someone that want contradict me first find Jewish workers in DMW social security ,medicaid housing office etc. 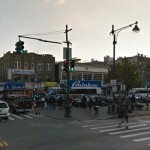 compare how much Jewish have free education in Brooklyn even comparing with illegal immigrants….